“A bruised reed He will not break and smoking flax He will not quench” (Isaiah 42:3). Woodwind instruments such as the modern flute, clarinet andoboe are today’s counterpart to ancient reed instruments such as the pipe and double aulos, which were made from river cane. In Bible times, the maker of reed instruments was very particular in his selection of materials. He looked for a perfectly formed reed, not one that was blemished or bruised. Knowing that an imperfect reed affected the quality of the sound it produced, he would break and discard reeds that were bruised. Likewise, in Bible times a woman was careful to keep the flax wick in her oil lamp trimmed so the charred remnant would not smoke and emit a horrible odor throughout her home. When the flaxen wick served its purpose and was burned up, she doused it with water and threw it out the window to get rid of it, quickly replacing it with a new wick. Instead of extinguishing us when we were used up and burned out, the moment we surrendered our lives to Him, the Lord restored us, giving us a new fire—a light that all may see. Is there an incident from your past you haven’t surrendered to the Lord? Is something keeping you from living in the complete freedom Jesus paid the price for you to have? 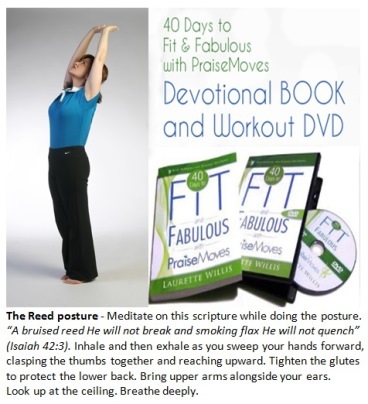 PraiseMoves Workout DVD & Devotional Book SET.